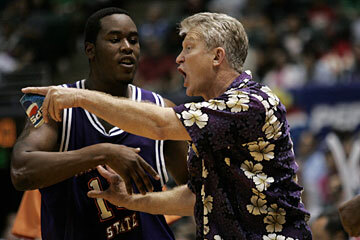 Matt Gibson of Hawaii stole the ball at mid-court from Michael McConathy of Northwestern State. Spurred by a hot start and career nights from two starters, the Hawaii basketball team opened a busy pre-Christmas stretch with an 89-78 win over Northwestern State last night at the Stan Sheriff Center. Hawaii saw a 20-point first-half lead dwindle to five early in the second half against the Demons. But the Rainbow Warriors reclaimed control with a 21-3 run and ended a two-game skid with their highest scoring game of the season in front of a crowd of 4,497. "I thought we were ready to play at the start of the ballgame. That was an emphasis coming out of the locker room," UH coach Riley Wallace said. "We're 4-0 when we lead at halftime, and 0-4 when we don't. We attacked them and played with the confidence a home team's supposed to play with." Hawaii's Bobby Nash enjoyed the biggest night as a Rainbow, scoring 16 of his career-high 22 points in the first half. Nash played power forward for much of night, grabbing 11 rebounds for his first double-double performance. "I just wanted to get on a good start," Nash said. "Coach talked about us being sluggish and how in 50 percent of the games that we've lost we haven't had good starts." Guard Matt Lojeski also had his best scoring night of his career, pouring in 20 of his 25 points after NSU cut the UH lead to five in the second half. He ignited the decisive run with a 3-pointer at the 15:20 mark. Riley Luettgerodt contributed with a season-high 13 points off the bench, while Matt Gibson had 14 as the Rainbows improved to 5-4 heading into the Outrigger Hotels Rainbow Classic, which opens Wednesday. "It was a good win," Luettgerodt said. "We were off for 11 days, we had that sour taste in our mouth and we were tired of beating up on each other in practice." Northwestern State (5-5) played without its leading scorer, as reserve forward Trey Gilder sat out with a broken hand. Head coach Mike McConathy also missed most of the second half after he picked up two technical fouls. "We don't dwell a lot of what happens if we lose a player because we play so many people, but we just struggled offensively in the first half," said McConathy, who declined to comment on the sequence that led to his ejection with 11:50 left in the game. "They were strong and physical and we didn't come to play that same physical-type game. It was almost like we were deer in the headlights." Northwestern State head coach Mike McConathy was restrained by Gerrell Thomas as he vented his anger at the referees before being ejected from last night's game. Hawaii scored off the opening tip and took command by bolting to a 23-5 lead 8 minutes into the game and led 36-23 at halftime. Nash's layup 4 seconds into the game ignited a 16-point first-half outburst for the junior forward. He had 12 points at the 12-minute mark, drilling back-to-back 3-pointers from the right corner to cap a 14-0 run that put UH ahead by 18. Northwestern State, meanwhile, went more than 9 minutes without a field goal and trailed 30-11 when Nash hit another 3-pointer from the top. Northwestern State guard Kennan Jones had 11 points in the first half, but none of his teammates had more than three as NSU shot 6-for-30 from the field in the first half. "Coach Riley Wallace had their team prepared," McConathy said. "They scored five buckets in the paint within the first juncture of the game, they were 9-for-13 and we were 2-for-11 and we missed a lot of easy points." After trailing by as many as 20 in the first half, the Demons made their first five shots of the second half and closed to within 42-37 when guard Luke Rogers banked in a jumper to close an 8-0 run. "Even when we were up 20 I felt like if you relax they're going to get back in the ballgame because they're that kind of team," Wallace said. Following the media timeout, Lojeski drained a long 3-pointer from the right wing to send the 'Bows on a 15-0 spurt. Lojeski also drove to the rim for a layup and hit two free throws to push the lead back to 57-37. "We just had to find some energy, get it going and we had to wake up," Lojeski said. "Coach just got into us to find some energy and get some stops. "It seems like we feed our game off of our defense. We get opens shots, we get layups, we get fouls." The lead swelled to 23 and Northwestern State wouldn't get closer than 10 for the remainder of the game. Rogers led the Demons with 22 points, while Jones finished with 14. 3-point goals -- NW St. 4-10 (Hancock 2-3, Jones 1-1, Rogers 1-2, Thomas 0-1, Woods 0-1, Bargeman 0-2), Hawaii 6-16 (Nash 3-4, Gibson 1-3, Lojeski 1-4, Luettgerodt, 1-4, Waters 0-1). Personal fouls -- NW St. 24, Hawaii 26. Fouled out -- Thomas. Technical fouls--NW St. TEAM 2 Steals -- NW St. 7 (Rogers 2, Bargeman 2, Moody, Jones, Porterio), Hawaii 4 (Gibson 2, Nash, Lojeski). Blocked shots -- NW St. 3 (Bargeman 2, Moody), Hawaii 6 (Gueye 2, Lojeski 2, Verwers, Follmer). Turnovers -- NW St. 12 (Rogers 3, Moody 2, Bargeman 2, Thomas, Jones, McConathy, Woods, Ross), Hawaii 16 (Waters 4, Lojeski 3, Gibson 2, Gueye 2, Nash, Owsley, Verwers, Veit, TEAM). Officials -- Bill Gracey, Ronnie Hernandez, Donovan Lewis. A--6,142.